Dr. Goldin is board certified by the American Board of Urology and is a fellow of the American College of Surgeons. He is a member of the AMA, Virginia State Medical Society and the American Board of Urology. 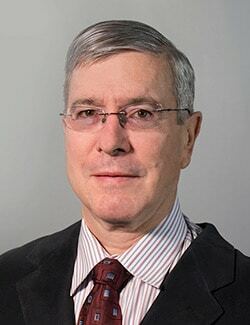 He was president of the Portsmouth Academy of Medicine from 2006-2007 and is the past chairman of Jewish Healthcare International, serving from 2006-2009. Dr. Goldin says he finds real pleasure in treating urologic conditions. “The gratification derived by both treating and preventing a wide variety of acute and chronic urological illnesses is what motivates me. It’s so rewarding to see dramatic improvements in a patient’s quality of life”. Dr. Goldin’s area of interest is general urology including: yearly prostate check-ups, kidney stones, urinary incontinence, cancer diagnoses and treatment, erectile dysfunction and testicular anomalies. When not working, Dr. Goldin enjoys time with his wife and three grown children. He also enjoys biking, skiing and golfing.